Chelsea manager Maurizio Sarri has indicated that Eden Hazard only suffered a minor knock during the club's 2-1 Premier League win over Brighton & Hove Albion on the road. The Belgium international had bagged four assists from his previous three appearances for the club and he continued the good vein of form at the AmEx Stadium, where he bagged a goal and assist. Despite this, there were fears that he may have suffered an injury after coming off late following a heavy challenge from Dale Stephens but Sarri has now allayed the concerns. He said via The Mirror: "Eden is okay. It's only a knock, only a knock. I spoke with the doctor and it's not a big problem. Maybe one day to rest, two days at most." 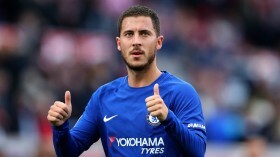 Hazard had recently gone through a two-month spell without finding the scoresheet but he managed to end the streak at Brighton where he scored the Blues' second goal in a 2-1 triumph. The victory sees the Blues maintain the fourth position in the standings and they now have a three-point advantage over fifth-placed Arsenal, who suffered a damaging defeat at Southampton.